GfK's consumer optimism index tumbled again in November to -12 points. This bodes badly for the future, it is implied. Except, as this blog has pointed out before, consumer 'optimism' simply reflects current reality. Consumers simply don't have a crystal ball that enables them to forecast the future beyond projecting a straight line from present circumstances. 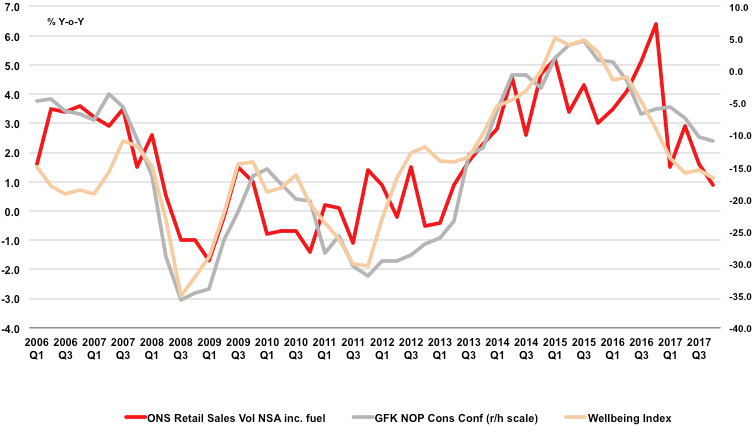 If we take ConsumerCast's economic Wellbeing Index, based on growth in household net income, inflation and the change in the unemployment rate, and compare it with GfK's 'optimism', their movements have matched each other very strongly in the last decade. So 'optimism' as measured by GfK (and others, like YouGov) is really just a current 'feel good' index. Unsurprisingly, this feel good factor is also very closely aligned with how much stuff (in terms of sales volume) consumers are willing to buy in the shops and online, here and now, not in the future. Based on past experience, a score of -12 is pointing towards a retail sales volume growth rate of around 1.5% to 2.0% a year. This is half the buoyant rate of 2014 and 2015, but then 2015 saw shop price deflation give retailers' top line performance a kicking anyway. So volume growth is not always what it is cracked up to be unless your profit margins hold up. A figure of 2.0% or less is clearly not great by past experience, especially if you're a big ticket retailer that has expanded store space on the expectation of a recovery to pre-2008 boom times. However, it is looking like being the new normal in a UK economy that is painfully re-balancing away from domestic demand growth, the main driver of the recovery since the financial crisis. Short of a strong uptick in wage rises (still a vague possibility given increasing labour shortages being reported by business), the heady days of strong, continued UK retail sales growth are unlikely to return for some time.